The widest selection of guided walking holidays on Scottish Islands, organised and run by the people who know them best! We ALWAYS do our best to provide single occupancy rooms to single travellers. All holidays start and finish in Inverness and INCLUDE travel to and from the islands. Comfortable accommodation in island guest houses and B&Bs, with ensuite or private bathrooms wherever possible. Our 2019 programme of Scottish island walking holidays offers tremendous variety and great value. We will be running holidays on all the Outer Hebridean islands, ranging from Barra & Vatersay in the south to Lewis and Harris in the north. We will be exploring some wonderful, off-the-beaten-track routes on the Isle of Skye and heading north to visit the spell binding island archipelagoes of Orkney and Shetland. Our walking tours are small, relaxed and friendly. Each party has a maximum of 8 people. We find that small groups are often friendlier, allow for greater tailoring of the holiday to people's particular interests...and just seem to work better in the intimate scale of the islands, where large groups can feel like an intrusion into a wild landscape and detract from the overall experience. Many of our tours include day trips to some of the fabulous, uninhabited off-shore islands around the coast of Scotland. In 2019 we will again be running several holidays on Lewis and Harris which include a day trip to the unforgettable World Heritage Site of St. Kilda. We also hope to visit the towering seacliffs of Mingulay, a dramatic and deserted island off the southern coast of the Outer Hebrides. HARRIS & LEWIS - Wonderfully varied walking on the two largest islands of the Outer Hebrides. From the rocky headlands of Ness to the dramatic beaches of Harris this week of spectacular gentle hiking is the perfect introduction to these wonderful islands. OUTER HEBRIDES HIGHLIGHTS - Covering 10 islands (sometimes more!) 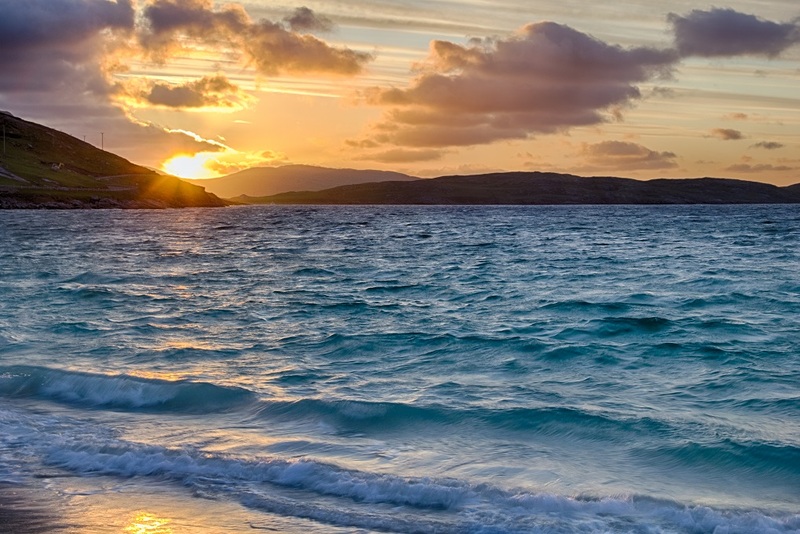 in 6 days, this holiday is the perfect introduction to the Outer Hebrides. From the wild coastline of Lewis to the spectacular birdlife of Uists and Barra's famously beautiful beaches, this holiday covers all the main islands of this stunning archipelago. THE UISTS & BARRA - A tremendous week long tour exploring the beautiful and remote Southern Isles. Spectacular, deserted beaches, abundant wildlife and wild, watery landscapes quite unlike anywhere else in Britain are all guaranteed on this memorable trip. The holiday concludes with a boat trip to the wonderful, deserted island of Mingulay, a mini-St.Kilda at the far southern tip of the Outer Hebrides. ORKNEY - Standing stones! Puffins! Sunken Ships! Join us on this fantastic week as we island hop around the amazing Orkney islands. We will be visiting 4 separate islands during the course of this week, providing a tremendous introduction to this wonderful archipelago. It goes without saying that the walking here in the far north is excellent, but Orkney offers so much more, with some of the finest archaeology in Northern Europe, outstanding wildlife and a unique culture and heritage, half Scottish and half Scandanavian. SHETLAND - Join us in a trip to Scotland's most northerly islands and discover amazing Shetland! A stunningly beautiful collection of large and small islands, many still inhabited, Shetland looks and feels more Norwegian than Scottish. This is without doubt the best place in Britain for wildlife enthusiasts - as well as awesome seabird colonies on several of its seacliffs, otters are commonly seen around the coastline and whales and dolphins are frequent in the surrounding seas. Visiting 6 islands over the course of the week, this holiday will let you enjoy some of Europe's most spectacular coastal walking. SKYE, RAASAY AND LOCH CORUISK - Get off the beaten track to discover the hidden corners of the world famous Isle of Skye - plus a day on the wonderful off-shore island of Raasay and a boat trip to the heart of the spectacular Cuillin mountains. Easy: These holidays go at a gentle pace, with plenty of time to stop, take pictures, soak up the atmosphere and watch the wildlife. However, they are still walking holidays, so you will need to be able to cope with a reasonable amount of hiking each day. As a guide, you should be able to manage small hills, be comfortable walking for 4 - 5 hours and 12km or so each day, and be confident walking off a path - for example over rough, pathless heather moorland. We try to keep to easy ground as much as possible on these walks, but there will be some areas where the going can be a little rough and quite wet underfoot, so good hiking boots are essential. We don't tackle any hills on these walks but there are usually some modest uphill sections each day. Moderate: Holidays at this grade involve somewhat longer walks and can include some easy hill days. Again, the ground can be rough underfoot in places, so good hiking boots are essential. As a guide, you should be happy going up simple hills and walking on rough, pathless ground for some of the time. We are not talking mountain marathons here - if you've ever been up a Munro or a peak in the Lake District or Snowdonia, you will be fine on these holidays. Longer days are always followed by shorter ones, to allow time to recover, and the pace will always be gentle. Walks will vary from 10 - 15 km in length, and we are likely to be walking each day for between 5 and 7 hours. We work with selected island guest houses and hostels we know and trust and who have excellent reputations for their hospitality and quality.